Designed by Frank Lloyd Wright from 1916-1922, the Imperial Hotel of Tokyo, Japan was commissioned to bridge the divide between the Western and Eastern worlds. This modern masterpiece exemplifies Frank Lloyd Wright's imagination and genius, designed in the shape of it’s own monogram logo and strong enough to withstand Japan’s frequent and devastating earthquakes. Today, the main entrance and lobby are all that remains of this icon, displayed in the Meiji Museum in Nogoya, Japan. This highly detailed LEGO® model, co-developed and designed by LEGO architects, captures all of the distinctive features that made the Imperial Hotel an architectural landmark for generations. The assembled Imperial Hotel model stands over 11" (28cm) wide on a base with printed name label. Set includes a booklet with facts about the building, its construction and its history. This comes down to 15.99 cent per brick. 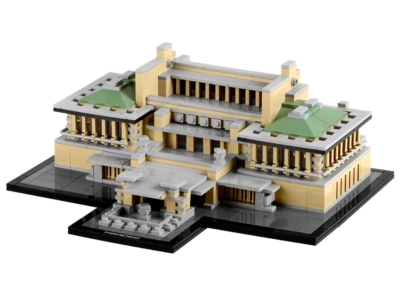 The Imperial Hotel (21017) Lego set is no longer directly available from the sites below. However, 3rd party partners of these sites might still have the set available. Alternate description Build Frank Lloyd Wright’s Tokyo masterpiece! Build the famous Frank Lloyd Wright hotel of Tokyo Japan, a 250-room modern masterpiece in LEGO® microscale!